The base - fits the pump, power socket, grill and support for the nozzle + support. Support - fits the switch and nozzle and has a cut-in for a sticky label for the name of the drink. Print upside down. Nozzle - fits in the support and guides the tube. Print upside down. Drip Tray - fits in the base, 80mm x 80mm x 5mm. Tube cover - covers the tube on the top of the support. Attach the support piece to the base using M3 bolts. Attach the nozzle rack to the display unit (purple and green pieces in photo) with a push fit. Feed the tubing through each and cut off the excess tube. Attach the hose cover using M3x10mm bolts. Solder wires on the power supply port and feed it through the hole. Connect the positive wire to the positive pump and the negative wire to the switch. Finally connect the switch (use COM and NO on the switch) to the pump. Connect a 12V 2A power supply to the power socket. Press the switch to ensure the pump works. Using superglue or a hot glue gun, glue the STOP piece to the switch. 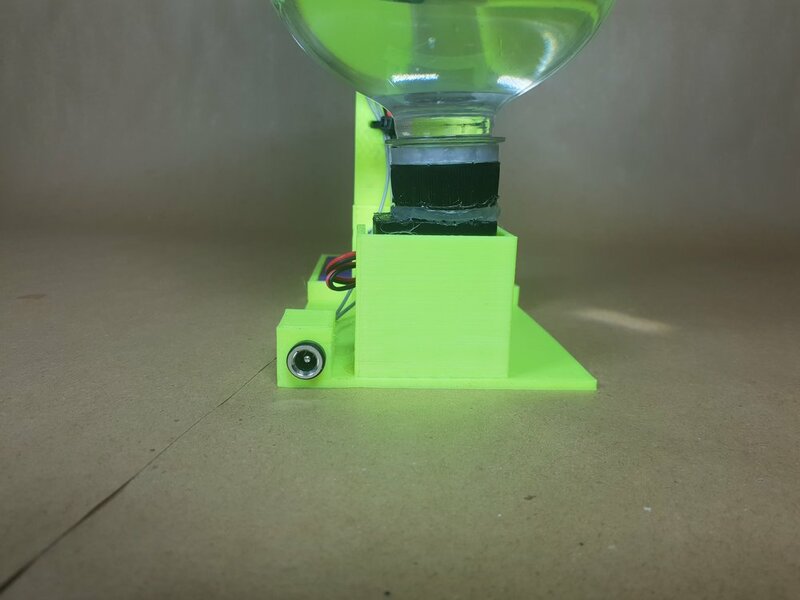 Note: with the current design, the level of the liquid in the bottle cannot be higher than the top of the support piece. You can solve this printing an extender to raise the support height, adding a 12v valve, moving the bottle below the desk and having a long tube (the pumps can lift 3 meters) or using smaller bottles. Connect the power supply, pump and switch in series.